A file with the .epub file extension is a popular file format used for storing eBooks and other types of content. EPUB, short for electronic publication, was named the official standard of the International Digital Publishing Forum (IDPF) in September 2007. EPUB files can store words, images, stylesheets, fonts, metadata details, and tables of content. They are considered layout agnostic, meaning that screen size doesn’t affect the formatting—EPUB files can display content on screens as small as 3.5″. This and the fact it’s a freely available standard is why a majority of eReaders support EPUB files. Because of their widespread use, more hardware eReaders support EPUB files than any other eBook file format. You can open an EPUB file whether you’re using a Kobo, Barnes & Noble Nook, or even on your desktop using one of the many free programs, such as Calibre or Stanza Desktop. The notable exception here is Kindle. You cannot read an EPUB file directly on a Kindle, but there are ways to convert one to something the Kindle can use. iPhone and Android devices come preloaded with their own applications to open eBooks—iBooks and Google Play. If you’re trying to open one on your desktop, you’ll probably want a third-party application. If you use Windows 10, Microsoft Edge can display EPUB files natively. If Edge isn’t already set up as the default program to handle EPUB files, right-click on the file, point to the “Open With” menu, and then click the “Microsoft Edge” option. 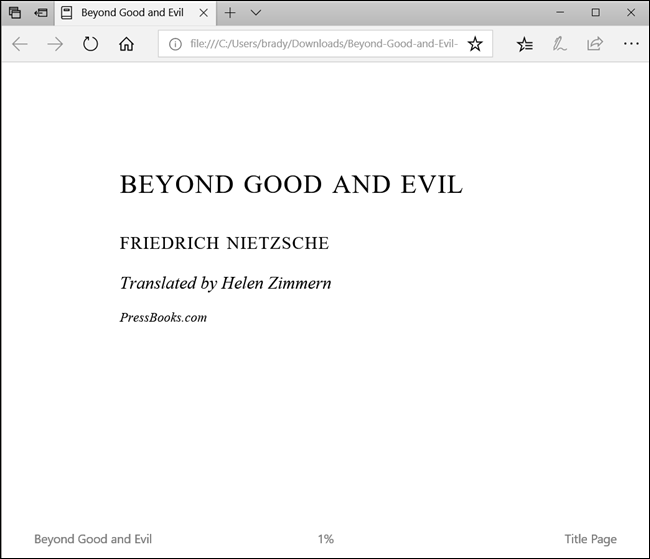 Edge will then open up a new tab with your book displayed in the same format it uses for Reader View. Of course, Edge isn’t going to give you the best reading experience. We’d still recommend using something like Calibre, which can open any number of eBook formats. Just like any other file format, you need specialized software to handle converting EPUB into a different format. If you try to change the extension, you could wind up with a corrupt and unusable file. Unless you’re using Kindle, which uses a proprietary file format, your eReader probably already supports EPUB, and all you have to do is open the file on your eReader or smartphone device. But you can use an EPUB file on your Kindle; you just have to convert it first. For this, we again recommend Calibre. It not only lets you open and view eBooks, but it also has a powerful tool that can convert your file into one of 16 different formats, including the MOBI format that your Kindle can open. If you aren’t too keen on downloading third-party software, or you only have a book or two to convert and don’t want to bother, some websites can perform the conversion for you. Some free online file conversion sites include DocsPal, Convertio, ConvertFiles, and Zamzar. All of these work fine, though DocsPal is probably the simplest to use. Just head on over to any of those websites, upload your file(s), choose the format to which you want to convert, and the website handles the rest! Some require you to enter a valid email address so they can email you the file when it is done converting.